Oh, what a life! Seven days a week of gentle relaxation watching the world go by as you sip a never-ending supply of gin and tonics from the comfort of your luxurious floating home. That’s the dream but not quite the reality. On dry land it’s easy. The home you buy is fixed at the location you bought it. Unless you’ve bought a mobile home, there’s no problem finding a place to put it. In fact, a major factor in the buying process was probably your house’s location. It’s not so easy with a narrowboat. Whether you intend to use your new narrowboat for occasional cruising or as a full time home, the question of where you are going to moor it is something you need to consider BEFORE you make the purchase. Unfortunately for you, you can’t moor long term at the first pleasant spot you see on the canal bank. 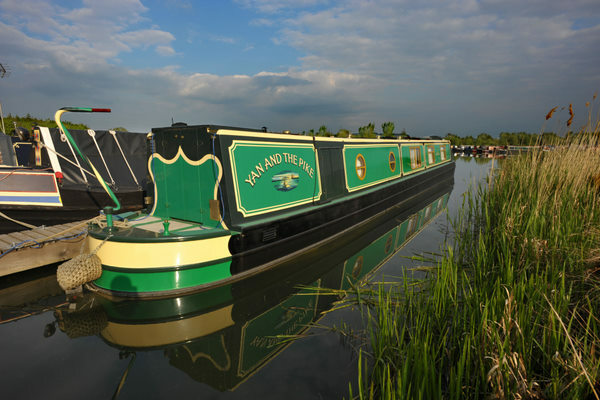 British Waterways – who control the vast majority of the canal network – have very strict regulations controlling both duration and purpose of narrowboat moorings. You have to find a dedicated mooring either on the cut or in a marina. Residential moorings in ANY location are very hard to come by. In your house, you don’t have to think about your utilities. Providing you pay your bills, everything is on tap. You press a light switch and the light comes on; you turn on a tap and you get a rush of hot and cold water; you turn a dial and your gas hob lights. You don’t have to worry about them running out. On your narrowboat it’s totally different. Your gas supply is in bottles weighing 50lb or more. Coal for your stove comes in dirty bags weighing just as much. Your electricity has to be generated by your boat’s engine and stored in batteries or, if you moor in a marina, is supplied from a pre payment point next to your boat. You water comes from an on board tank which must be filled by you at least once a week. What goes in must come out! At some stage you will have to remove your sewage from your boat. If you have a “Porta Potti” toilet with a removable cartridge beneath or behind the bowl, you will need to remove the cartridge and empty the contents at the nearest Elsan disposal point. If your toilet has a large holding tank, you will need to take your boat to the nearest boatyard or marina to have the toilet pumped out. You can expect to pay £10-£20 for each pump out. Modern boats should have good quality insulation to prevent heat loss in the winter and overheating in the summer. Modern heating systems are quite efficient and can be run at any time of the day or night but heating your boat and heating the water on your boat whatever its age usually requires a degree of thought. Many boats rely on solid fuel stoves for heating. Solid fuel in the form of coal or wood is difficult to light so you have to ensure that you have a good supply of newspaper and kindling or firelighters to hand. Solid fuel is also dirty. Your stove and the flooring around your stove must be cleaned on a regular basis. You will want to be able to receive letters by post (and you will need to receive bills too). You need to use a phone, and you will probably want to access the internet and your email. And you possibly want to watch television. All of these methods of communication are just a little more difficult when living on a narrowboat. Narrowboat marinas and canal-side moorings are often remote from TV and mobile telephone transmitters. And, of course, you are unlikely to be on your postman’s regular route. There is always a solution though. You can buy a laptop “dongle” to give you access to the internet. You can ask friends or family or the marina where you moor to accept post for you. You WILL be able to receive a mobile phone signal… but you may have to change network provider (and you may have to make your calls with your head out of the window). You can watch television. You can even receive satellite signals providing you fit your boat with an aerial and a correctly aligned dish for satellite signals. A narrowboat is just 6’10” wide and no more than 70’ long (no more than 60’ long if you want to explore all of the canal network). Even on the longest narrowboat, once you have allowed for the foredeck and engine room, you probably have no more than 55’ of living space. You have to fit all of your worldly possessions into this space. You will have to say goodbye to your three piece suite, wardrobes, chests of drawers, super-size television and music system and the contents of your shed and garage. You simply won’t have room for them all. You will have to get used to FAR smaller rooms on your boat. You will get used to using every last nook and cranny to hide things. You will have cupboards under your bed, under all of your seating, in your gas locker, your engine room and your foredeck. Your boat probably won’t have a washing machine. You won’t have the space and, even if you do, you won’t like the power it uses. You will probably have to rely on a local laundry service either in a marina or the nearest town. It’s quite a list of downsides for you to consider. Living on a narrowboat isn’t for everyone. You have to accept that you will work a little harder to achieve what you take for granted on dry land. Things take a little bit longer. But that’s OK. Life at a slower pace is more relaxing, more rewarding and more enjoyable. Rather than watch mind numbing late night television, you can turn in a little earlier than you would normally and listen to the natural sounds around you; the gentle patter of rain on your roof, the lapping of water against the side of your boat, owls hooting and ducks quacking. Unfortunately, it’s so relaxing you won’t be able to stay awake long enough to enjoy it.